Moving The People Of Coventry For Over 80 Years. Allens Taxis is Coventry’s premier private hire company. Whatever your requirements we are here to help. We have the ‘know how’ and experience to transport you to where you need to be. Allens Taxis has been moving the people of Coventry since 1938 and is Coventry’s oldest taxi firm. We pride ourselves on embracing technology and blending harmoniously, latest industry innovations with our trusted customer service. One of the largest taxi fleets in Coventry. Available 24/7/365 days a year. Saloon cars, 5,6,7,and 8 seaters, wheelchair accessible and electric vehicles. Guaranteed prompt efficient service that provides value for money without compromising on quality. Our Corporate customers have a dedicated account manager and benefit from a priority service. It’s important to us that we provide a reputable, safe and reliable, 24/7, local, fully compliant taxi service. Students can also download our free app, giving them access to booking and real-time tracking. Situated outside main entrance and CSB + free phones across site + our switchboard is accessible from any phone. Dial # 6262. Work for the oldest most reputable taxi firm in Coventry. We have a dedicated management team with many years’ experience in the trade. We understand that you, the drivers are our customers. As a team we will provide the best service for drivers and customers. Allens taxis has been moving the people of Coventry since 1938 (except during WWII) Owners Paddy & Susan are ‘Coventry Kids’ born and bred and are proud to have amalgamated Godiva Taxis, Allens Taxis and Trinty St Taxis, 3 giants of the Coventry Taxi trade under one roof. Booking a Taxi Couldn't Be Easier! Book a Taxi ASAP or pre-book in advance. Track your bookings, Follow your cab on the app. insured and fully vetted drivers. We have corporate clients with all sizes of accounts. Regardless of size, all of our corporate accounts will receive a dedicated service. You work hard to make sure your business runs well so your business deserves a professional reliable trusted taxi company to help transport your clients, your employees and yourself safely, punctually and in style. Our large fleet of taxis are available for your daily needs and corporate hospitality, events and business meetings. Build a relationship with your own dedicated 1:1 account manager offering consistency and reliability. Pay by direct debit, standing order, BACS, CHAPS or card. We are open 24/7/365 because we know not all businesses are 9 to 5 Monday to Friday. Once you have booked a cab with us via the phone or our app, we will ensure your cab is there to pick you up on time. All our vehicles are fitted with taxi meters which can only be adjusted by Coventry City Council’s Licensing Authority. They are set to current maximum tariffs, drivers can charge less but not more. We will not charge more at busy periods as some app based companies do. After booking you can cancel any time before your journey & be rest assured that you will not incur any charges. Just give us a call. It couldn’t be easier to download our free app and book and track your taxi in real time location. Pay cash directly to the driver or by card over the phone. We are introducing card payment terminals in our vehicles. Corporate clients can pay on account (upon application). Book from 10 minutes to 3 months ahead: 4,5,6,7,8 seaters. 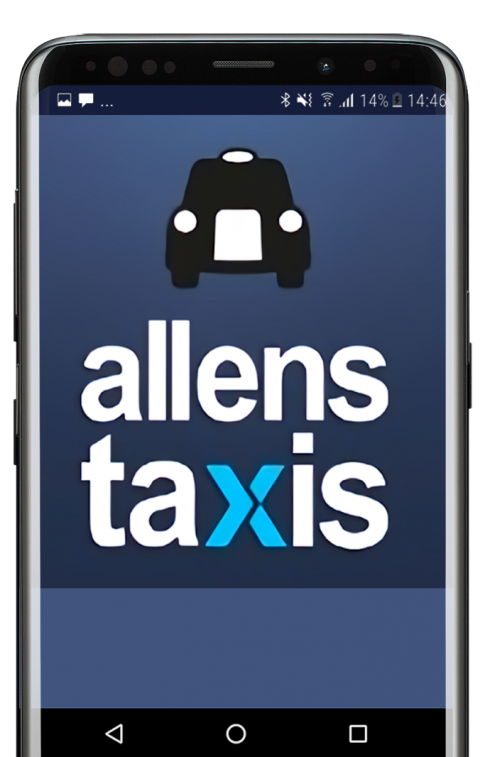 Allens Taxis automated booking services makes ordering taxis as easy as 1-2-3. Automated Booking Services Giving Priority to Regular Customers. IVR (Integrated Voice Response), gives Allens Taxis the ability to offer faster efficient services to more customers. Save 10% on all return bookings that are paid for in advance.